Investors who put their money in safe bets such as bank fixed deposit and gold saw better returns than mutual funds, equity and real estate investors in 2018. A one-year bank fixed deposit (FD) earned a return upwards of 6.5 per cent along with capital safety, whereas gold gave a return of 7.1 per cent in 2018. Other investments such as stocks, equity mutual funds, debt mutual funds and real estate failed to impress investors. Even earning a 7 per cent return on investment seemed to be a distant dream. Sensex gained only 5.12 per cent whereas Nifty was up by 2.2 per cent in the same time frame. The dismal returns in 2018 stood in contrast to 2017 when Sensex gained 29.58% while the NSE Nifty was up 30.28%. Many equity mutual funds displayed negative growth this year, effectively eroding investor wealth instead of creating it. On an average, equity mutual funds provided a disappointing return of negative 6.6 per cent in the 1 year period. 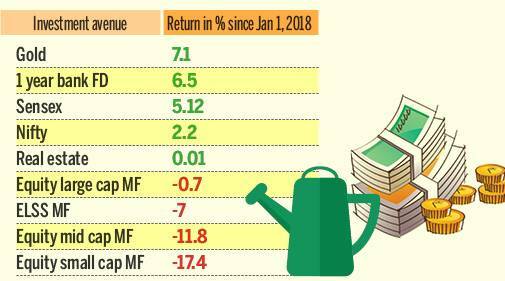 Equity mutual funds across categories such as large cap, mid cap and small cap gave negative returns of 0.7 per cent, 11.8 per cent and 17.4 per cent, respectively. ELSS (Equity Linked Savings Scheme) mutual funds, used by many salaried class investors to get tax exemption, also provided a return of negative 7 per cent. Debt mutual funds provided a return of 6.4 per cent. The only type of mutual funds that performed exceedingly well was from the technology sector with returns as high as 26 per cent. It wasn’t the best year for those who had invested in real estate either. Real estate showed an appreciation of just 0.01 per cent. Average property prices remained largely static across the top 7 cities in 2018. In fact, average property prices at the pan-India level saw only 1% increase in 2018, as per data from Anarock. To sum it up, the investors who chose FDs and gold over mutual funds and real estate proved to be in a much better position. Several banks hiked up interest rates for fixed deposits of less than Rs 1 crore, making them an attractive savings option. The list includes HDFC Bank, Punjab National Bank, Kotak Mahindra Bank, Canara Bank, Axis Bank and, ICICI Bank.